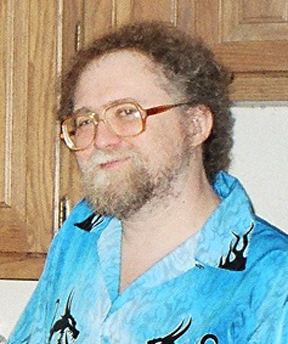 Aaron Allston (December 8, 1960 – February 27, 2014) was an American science fiction and fantasy writer. He's written a bunch of novels in the Star Wars Expanded Universe, including a third of Legacy of the Force, a third of Fate of the Jedi, and about half of the X Wing Series, as well as tie-ins for Terminator and several roleplaying game settings. Allston also helped write the manual for the original Wing Commander, "Claw Marks," as well as the Dungeons and Dragons Rules Cyclopedia, which combined the rules of the first four of the Frank Mentzer BECMI boxed sets for Basic D&D into a single volume. He's also known for extensive work on the Champions role-playing game, including the award-winning supplement "Strike Force," earning him the allegedly-unwanted epithet "Champions Guru." Among his own non-tie-in works, possibly the best-known is Doc Sidhe, which might be described in X Meets Y fashion as "Doc Savage with Elves". This page was last edited on 13 February 2019, at 23:18.